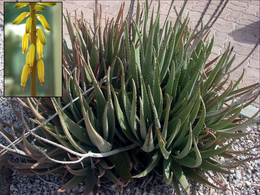 Aloe vera (/ˈæloʊiː/ or /ˈæloʊ/) is a species of succulent plant in the genus Aloe. It is originally from the Arabian Peninsula but it grows wild in tropical climates around the world. It is a popular houseplant species. Aloe vera is used in many consumer products. These include drinks, skin lotion, cosmetics, and ointments for small burns and sunburns. There is little scientific evidence that Aloe vera works for treating burns or sunburns or that it is safe for treating them. ↑ Perkins, Cyndi. "Is Aloe a Tropical Plant?". SFgate.com. Retrieved 13 February 2016. This page was last changed on 24 January 2019, at 16:59.